Many inexperienced stagers offer a f.ree one hour staging consultation. It's a fast road to burn out and business failure. Imagine the number of tire-kickers you'll get! Consider the time it takes to prepare for, schedule, travel to and attend these meetings, plus the inevitable phone calls you'd make after the fact to try and get the client to hire you. Conservatively, I'd estimate the f.ree "hour" takes you at least two or three hours when all is said and done. As soon as you walk through the front door, you'll be giving them advice. They'll ask you direct questions, "What color would you repaint the living room?" "Do you think this room shows well?" "What should I do with my family room?" etc. If you're there for a "fr.ee consultation," you'll have to answer these questions and more. Then why would the client feel compelled to hire you later? This is an excerpt from my comment in one of the many discussions currently taking place on the Staging Diva Network online discussion group. We also discuss this and related topics in the Staging Diva Training Program, course 3, "Taking the Mystery out of Home Staging Consultations"
I'm delighted to introduce you to Peggy, the new Manager of Operations. She is absolutely fabulous and I don't know how I ever managed without her! I'm also proud to introduce you to my new Executive Assistant Sandy who has done a great job getting Graduation Certificates out to you in a timely fashion, keeping the Staging Diva Network humming and many other behind the scenes details. Michelle, our indispensable Web Assistant figured out how to enable you to get daily emails of my posts on The Business of Home Staging and will be handling many other web-related improvements in the months ahead. Not the least of which will include driving ever-more traffic to the Staging Diva Directory of Home Stagers. Learning to let go of all the details and delegate has been a real challenge for me. Up until September I was doing everything(!) myself for both Staging Diva and my staging company Six Elements Inc. It was completely ridiculous and was burying me in details instead of letting me do the creative things I love best. Failure to let go at the right time has been the undoing of many previously successful entrepreneurs. Once I found this team, I literally burst into tears of relief. I'm now able to put more energy towards creating the new products mentioned here, with many more to come in the New Year! I've also got more time to devote to the many of you wanting home staging business coaching. Peggy and the team will quickly handle your questions about registrations, certificates, course downloads, memberships and more. Email Peggy if you need any help, she'll handle the matter personally or direct it to the right person. I'm still here for you; I'm just letting the team handle the more routine or administrative matters! I read this book about two years ago and it's taken me this long to stop resisting the message. Because my business was growing and doing well financially, I felt I could ignore the bigger issue. I was working IN my business instead of ON my business, and putting in way too many hours trying to do it all. As you can see from the introduction of the Staging Diva Team, I'm finally letting go of the details that are better handled by someone else. In getting out of my own way, I've found renewed freedom to go back to being creative, which is why I started this business in the first place! If you're serious about promoting your staging services, you need great before and after photos. These take time to plan and shoot; don't expect to run through a house and get a bunch of great shots in 10 minutes. These are some of the many tips contained in my new book coming out early in the New Year. Watch for more info on the new "Staging Diva Ultimate Guide to Creating the Perfect Portfolio to Sell Your Home Staging Services"
The Staging Diva Directory of Home Stagers is an effective way of being found by homeowners and agents looking for home stagers. That's a more appropriate audience than you'll reach sending out mass flyers or placing an ad in the local paper. Less than 3% of any population is ready to buy home staging when you're promoting it. But when you advertise on a well targeted web site that's getting traffic from people actively looking for a home stager, it's entirely different than mass marketing. With your own page in The Staging Diva Directory of Home Stagers, your chance of being found by the right people dramatically increases. And, you'll be seen by reporters looking for new sources to interview. Right now you can join the Staging Diva Directory for $695; which includes building your page, search engine copy, links, etc. And it includes hosting your page for a full year. I have not announced this publicly yet but in January, it will cost $395 to have your page built and then $45 per month to have it hosted on the Staging Diva site. This new billing method allows you to spread out the payments, but it's actually more expensive over the year. So, if you want to take advantage of the current pricing structure, please don't wait. I don't know where 2006 went! It's been a busy year with new Staging Diva Graduates starting and growing their businesses all over the US, Canada, Australia, Wales, England, South Africa and even the Philippines! I can't tell you how much I love hearing about how you've decided to follow your dreams and turn your passions into a new career. I've also been moved by the personal stories from many of you in various stages of divorce, leaving abusive relationships, recovering from cancer or just getting back on your feet after the death of a loved one. There are many very brave souls among the 4,000 of you who are part of this Staging Diva community. Whether you have already taken a course or not, please know that it is my honor to share whatever information I can with you and I hope that I'll continue to inspire you in whatever life path you choose. I hope you find the content of this final 2006 issue of Staging Diva Dispatch helpful; and I welcome any feedback or story ideas you'd like to see in 2007! It's important to consider that any one of these projects would likely more than pay for all your Staging Diva Training plus a listing in the Directory of Home Stagers. It's incredibly time-consuming playing matchmaker for hundreds of leads and then finding out who's in that market, contacting them, etc. If I don't immediately know who to send a lead to and that they'll be ready to handle it, most project leads are now being posted in "Stager Wanted" at The Business of Home Staging. You can read about new home staging projects anytime under the category Staging Help Wanted, and contact me directly if you're interested. Also note that you can now have my posts automatically emailed to you by signing up in the green box in the left column. Thank you Staging Diva Graduate and Staging Diva Network member Glenys Moss who came up with the idea of Staging Diva Gift Certificates that families and friends can purchase for you. Once purchased, the buyer receives an email with a link to your Gift Certificate. All they need to do is forward that email to you and you can redeem your Gift Certificate towards the purchase of any Staging Diva product or service within 3 months! I'm sure you can think of a few people in your life who would welcome the opportunity to support you in your dream of building a home staging business and appreciate the idea of not having to drag around a shopping mall to find you a meaningful holiday gift! Instead of spending $20, $40 or even $100 on something you don't really need, they can give you a boost towards achieving your business goals with a Staging Diva Gift Certificate. You can redeem the Certificate on any purchase, so if they send you $20, you can use it towards any item of greater or equal value, it's entirely up to you. Laurie Mahoney (Designed, Staged and Sold, NY), Allegra Shann (Styled and Sold, MD), Sandra Hughes (Redesigned Spaces, VA), and Kerri Brencsons (Lift Interiors, NJ). Photo provided by Kerri Brencsons. Kerri Brencsons took the lead on organizing this trip for Staging Diva Network members in the New York area. Between Dim Sum at Ruby Foos, dancing it up at Mamma Mia and celebrity watching at Pastis, the group shared lots of discussion of their home staging business successes and challenges. 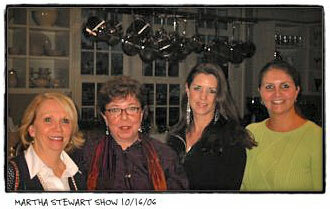 One of the highlights of the New York City trip was joining the live audience for a taping of the Martha Stewart Show. Against a backdrop of oohs and aahs from the Martha Stewart Show audience, the group was introduced as "the ladies who can spruce up your home before selling," reports Kerri. This event is only one example of the many things that can come out of membership in the Staging Diva Network. It's our password-protected online discussion group for Graduates of The Staging Diva Home Staging Training Program. With over 50 members, and over 1000 messages on 200 plus topics related to starting and growing a staging business, the Staging Diva Network is a great source of information, inspiration and support. Members share ideas, tips and resources and I contribute to the discussions every week by answering staging business questions, sharing my opinions on the topics being discussed, and/or starting new discussions. We had a great live TeleClass group in October. One of the students on the final evening asked me to tell her the top 5 things I'd suggest doing first. It made me remember how overwhelming it can be when you're starting out, especially if you suffer from "Perfectionitis." You know, that self-sabotaging need to have everything absolutely perfect before taking action... that fear that you'll make a mistake so you don't take the first step. My special thanks to Jean Glavin for asking the question that prompted this new Report, "Staging Diva Home Staging Business Quick Start Checklist: 20 steps to start your home staging business." I know this new report will save others from trying to re-invent the wheel. It gives you a quick "to do" list so you can take action towards building your business. "The Staging Diva Home Staging Business Quick Start Checklist relieves the stress of all the unknowns of starting a business. This step-by-step, and easy-to-follow list helped me stay organized, save time and save money." "The Staging Diva Home Staging Business Quick-Start Checklist takes away that feeling of 'oh my, now what...where do I begin?' Or in my case, 'am I going about this in the most efficient way, and am I forgetting anything crucial?' The Checklist helped me focus on when to do everything! I'm happy to report I've completed 11 of the 20 steps and I'm actively working on the rest! The Quick-Start Checklist is great, a very useful resource for anyone starting a home staging business." You can order it now for only $20 or if you sign up for the full Staging Diva Home Staging Training Program, I'll throw it in as a f'ree b0nus on top of the $100 you're already saving by ordering all five courses. Learn more about the new Staging Diva Home Staging Business Quick Start Checklist. You'll still s.a.v.e $100 when you purchase all 5 courses in one transaction, and you'll s.a.v.e an additional $20 by getting a f'ree copy of "Staging Diva Home Staging Business Quick Start Checklist: 20 steps to start your home staging business." I'm really proud of the newest Australian Staging Diva Graduate, Adam Luttrell of Hobart, Tasmania. Look at this beautiful shot from his home, which will be featured in a major Tasmanian newspaper. How are your own before and after photos coming along? It's difficult to land projects without a compelling portfolio! If you have a web page in the Staging Diva Directory, remember that your first year listing included updating all your photos and captions at no additional cost. Congratulations Leah Fritz of Perfect Place Home Staging, who staged one of those "cookie cutter" homes in a Wisconsin subdivision. There were over 50 others for sale but the one she staged sold in days for 98% of the asking price. Way to go Leah! Congrats also to Leah for getting her pick of the litter of this beautiful puppy, Nellie Bean. She's completely adorable and was a gift from a grateful client. There are so many heart-warming benefits to being a home stager, and this is just one example! As home stagers we provide such a valuable service. It can literally transform our clients' lives; which makes for VERY personally gratifying work! Congratulations to Karen Totten who made $14,000 on her first staging project which took 7 weeks to complete. Her client made $73,000, a great success story for marketing herself to new clients. Karen took the Staging Diva Training Program this summer and opted for the Staging Diva Accelerator Upgrade Package that gave her two hours of one-on-one coaching time with me. She used this partly to help her through her first project, since there was so much involved and later to discuss marketing ideas. The Staging Diva Accelerator Upgrade Package is only available when you register for the full 5 course Staging Diva Training Program. Whether you're signing up for live classes, or ordering the recordings, you'll be invited to add this upgrade which gives you 2 hours of coaching time with me to be used at any point over a 6 month period. The two hours can also be split up into 4 phone session at mutually convenient times. When you order this upgrade, you s.a.v.e. an additional $300 (over and above the $100 s.a.v.i.n.g.s on the courses themselves and the b0nus of the Home Staging Business Quick Start Checklist). Congratulations to Staging Diva Graduate LaJeanna Pilant who wrote a feature article on home staging for the Sept/Oct issue of R.E. 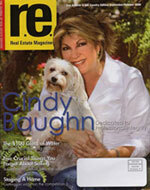 Real Estate Magazine's San Antonio and Hill Country Edition. No doubt this coverage will help generate leads for her company Alamo Home Staging. Thanks also to LaJeanna for including the Staging Diva Program in the story! I've made it easy for you to know when I've posted a new article to The Business of Home Staging. You can have a summary emailed to you whenever a new story appears and it will include a link to the actual story. This is a great way to find out about home staging project leads as soon as they appear, especially since I will no longer be emailing people with projects in their area. All you have to do to sign up for this new F.R.E.E. service is input your mailing address in the green sign up box on the left of the front page. Aside from being an educational resource, I've created an opportunity to build your own Internet presence by adding comments to the stories. It's easy. If you read something that you want to comment on, just click the comment link at the bottom of the story. HomeStyle Magazine is featuring my bathroom redesign and staging tips and the stagingdiva.com site in an article in January 2007. The magazine is distributed in newspapers to about 12 million households in the United States! Thanks to all of you who wrote to wish me luck for my first CBS radio interview. I was originally scheduled for November 6 but was bumped to the following week because of the wildfires that were burning around Los Angeles. The re-scheduled interview went well and the biggest relief was that my puppy didn't bark! Perhaps I just needed this small anxiety to focus on so I wouldn't worry about the bigger questions like "what would the host ask?" and "what would I say?" My other challenge was figuring out how to weave stagingdiva.com into one of my replies and mention that I offer a referral service for homeowners and agents looking for home stagers. The radio show ran in southern California and shortly thereafter I got a project lead for a vacant home that needs complete staging in Lancaster, CA. If you're interested there's a $250 referral fee payable to me, but ONLY if the client actually hires you. This covers my time playing match maker and the four years I've invested in getting the publicity that generates these kinds of leads for you. Another benefit of the CBC Radio interview is that now stagingdiva.com is linked from their website, which will drive more traffic from people looking for stagers and boost stagingdiva.com serach engine ranking. Will visitors find your company there? By the way, if you're listed in the Staging Diva Directory and a client finds you there on their own, there are no referral fees. If I get a project lead and then have to get involved in putting you together with the client, there are referral fees. Thank you Debbie McGennis-Howe of Set The Stage Interiors for letting me know that I was featured in a newspaper article in Florida's News Press. I had no idea because the reporter just grabbed what he needed from the Staging Diva website. Proving once again the importance of having an Internet presence to promote your staging business! If any of you see me in a local paper or magazine, I'd appreciate you letting me know! I'd be happy to send you a thank you gift in exchange for a copy of the story! By the way, apparently I was in an Ontario paper around Thanksgiving. I haven't seen that story yet. I wrote an article for the Century 21 Heritage newsletter that went to 3,500 homeowners in Ontario's 905 area, promoting the idea of home staging in general, and the Staging Diva Directory in particular. This is one of the many marketing ideas discussed in course 4 of The Staging Diva Training Program and it's already generated many project leads for local graduates. If you've been reading Staging Diva Dispatch all year, you know that I report on the latest media coverage for Staging Diva in every single issue. And these are MAJOR media like CNNMoney, The Wall Street Journal, Entrepreneur Magazine and many decor magazines, major newspapers, TV networks and now radio. In case you're wondering, I've never hired a PR firm; but it's no accident that I get this attention. It's all about marketing which is a huge component of what I teach in the Staging Diva Program. This media coverage also benefits Staging Diva Graduates IF they've taken action on what I've taught them in the Staging Diva Program. This includes survival strategies for being an entrepreneur (course 1), building a home staging portfolio (course 2), developing the right pricing strategy (course 2), learning how to turn a prospect into a buyer and get paid (course 3), effective marketing for each of the four key target audiences (course 4) and having the right alliances in place (course 5). I'm serious about helping my students build successful staging businesses. Please don't take my courses if you're not serious about that too. I got on a bit of a rant about this recently. You can read it here. 2007 is a brand new year, just waiting for you to take action and follow your dreams. I'd be honored to help you find your way and I am here to support you when you're ready. I'm just saying you've got to make the decision to be ready, even if you're terrified! Four years ago I hadn't staged my first client's house yet! I had nothing but my ideas, some before and after photos of my own house, and a dream to do something more creatively satisfying with my life. I was scared about whether I could pay my mortgage and support my family, as I needed to. I was scared no one would understand what home staging was, that I'd look silly, that no one would hire me. I wanted to give up many times in that first year, because it's hard work building a business. I'm very glad I kept going and I'm happy to share how I grew my staging company, Six Elements Inc. in such a short period of time. The Staging Diva Home Staging Training Program is all about sharing what I learned along the way so you can learn from my mistakes and have fewer frustrations along the way! Check out some of the most inspiring books I've ever read. The books that helped me get unstuck and take action. The books that helped me find my personal power and not run from it anymore!